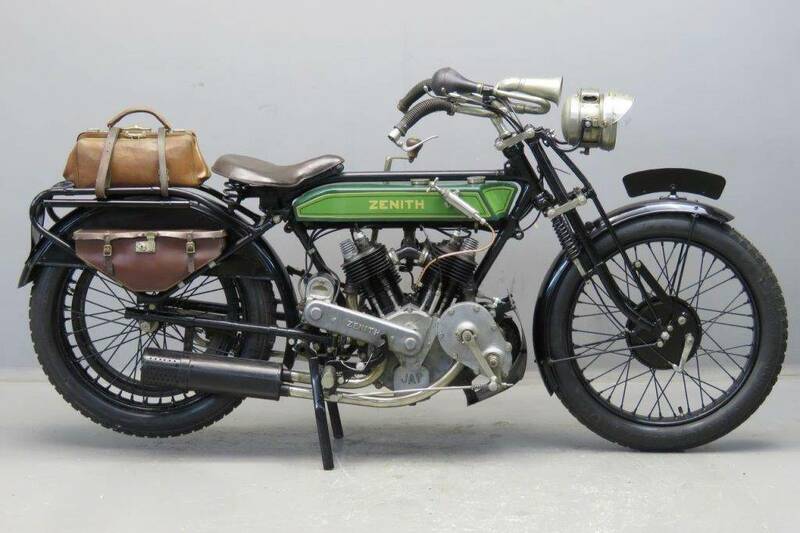 In pre W.W. 1 days Zenith machines gained many successes; driving force was chief engineer Freddy Barnes, who was responsible for the famous “Gradua” gear. The mechanics of the Gradua gear were a variable engine pulley worked by a handle, with simultaneous correction of the belt length made by sliding the rear wheel backwards or forwards in the fork slots. Its advantage showed itself most effectively in speed hill climbs. The Zenith rider could change during the journey up while the other competitors had to make do with a single choice of gear ratio. Rival riders and manufacturers thought that this was an unfair advantage so many leading clubs barred Gradua gear Zeniths from their hill climbs. Zenith was quick to recognize the publicity value and took the word “barred” as their trademark. The Gradua gear system was relatively expensive and had lost its technical head start by the early twenties. In 1923 a switch to a conventional gearbox was made; that year a number of models was available with Gradua gear or with Sturmey Archer countershaft gearbox. By 1924 all models were equipped with Sturmey Archer boxes. 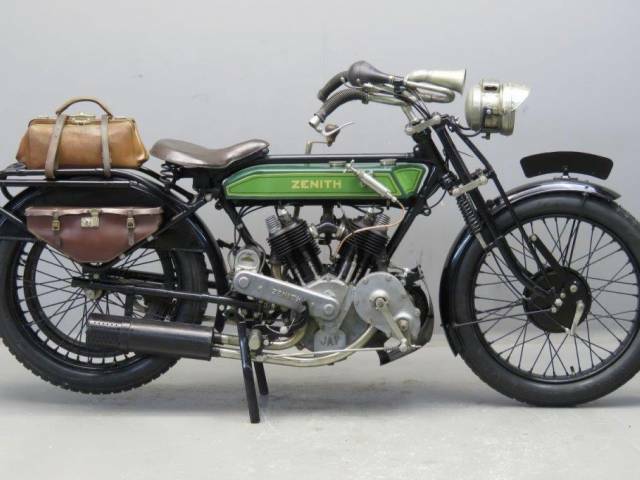 This Model H is fitted with the very practical countershaft with clutch and kick starter that was available as an extra since 1914. The clutch is a “metal to metal” cone clutch that runs in oil. The contraption is positioned in front of the engine and chain driven from the crankshaft. Added advantage, so the company claimed, was the extra long belt “giving the unequalled sweetness of the belt drive, combined with lengthened life of belt”.